St Etheldreda is a rare medieval Catholic church just off high Holborn in the centre of London. The name originates from the Anglo-Saxon saint who founded the monastery at Ely in 673 by the name of AEthelthryth (or Etheldrea). She was a popular saint at the time of the churches construction and many religious buildings commemorated her. The church was built in the thirteenth century around 1290 as a chapel. built by William De Luda the bishop of Ely on top of an earlier possibly roman structure. From its construction to 1570 it served as the bishop of Ely's town chapel in London, once part of a palace for the bishops of Ely for their visits to the city. 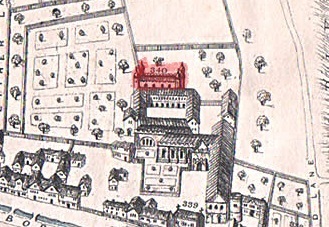 The picture bottom left shows the palace complex, with the chapel in red and the Bishops palace below it. The area around the chapel was not damaged by the Great fire in 1666 as it stood some way out of the city walls. In the eighteenth century the bishops were forced by an act of parliament to sell the chapel to the crown. The crown then sold to Charles Cole, an architect and developer who demolished everything on the site but the chapel. He built Ely place which is lined with fine Georgian houses and restored the chapel which was reopened in 1786. Barely a century later the chapel changed hands again as it was bought in 1874 by the Roman Catholic church. This makes St Etheldreda one of only a few medieval buildings own by the Catholic church. It became a scheduled ancient monument in 1925 by the royal commission on historical monuments who recognising its importance. However, it came under attack from German air raids during the Second World War. It was badly damaged when a bomb tore a hole in the roof, destroying much of the roof and shattering the Victorian stained glass. Thankfully the fine thirteenth century tracery in the west window miraculously survived the bombing unscathed. After the war the church was sensitively restored and remains a interesting piece of history in a quiet corner of the busy centre of London. The church consists of two levels, a chapel above and a under croft below, a layout typical in private chapels. The most distinguished feature of the church is its fine thirteenth century early decorated tracery in the west window (the Ely place street side of the chapel). The church is a rare example of the decorated style in the city of London, the tracery being some of the only of this style and date in the city. The west window also claims to be the largest stained glass window in London which seems unlikely but is in fact true. This is a really interesting blog! It's interesting to see which parts of London survived 1666 (even if many of those properties unfortunately are no longer around today). Thank-you for your comment, few buildings inside the city walls survived the great fire undamaged but most on the outside did (apart from some bits in the west) as the walls prevented the spread of the flames. Many buildings previously outside London walls which are now considered the city centre were not destroyed in the fire -such as above. It is surprising to me just how much of Medieval London which survived 1666 was lost in the late Victorian era. An example is Aldgate street (Post coming soon) where by a ancient street was almost totally eradicated for the development of the railways. Just reading Douglas HYDE's 1952 "I believed", he mentions the church as his first visit to a Catholic Church and his personal facination with medieval architecture. It seems as if he was being guided. In this Blog the term 'medieval' has been used to cover the period from 1066 to 1666. I have attributed copyright holders on images when known. Permission to reproduce any of these images should be obtained from the the copyright holder.